Wedding Season – Keepsake Memory Box! Having been a scrapbooker for many years now I keep all those little memories, from ticket stubs to receipts, snapshots of days out and ordinary moments through to the childrens wrist bands when they were born and the cork from a special bottle of champagne. Since wedding season is well and truly upon up and I have been invited to more than my fair share I thought I would hopefully start others off down the same route. I am a firm believer in getting gifts that mean something so for me a memory box is ideal, especially if it is someone I have known a while as chances are I will have something I can pop in the box to start things off. How fabulous would it be to start married life with a box to keep a little confetti, maybe a napkin from the lunch and everyone has favours – this would be the ideal place to keep all those little special items from a very special day. 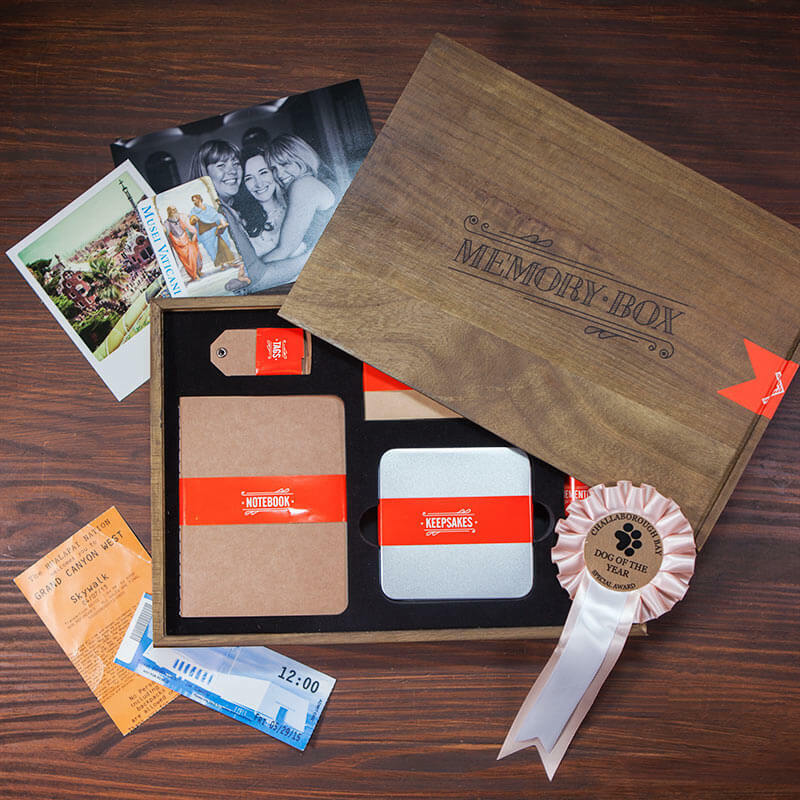 Of course the memory box doesn’t just have to be used for weddings – I have one for the children that I plan on giving them when they each turn 18, filled with tickets and tokens from days out together. Maybe a piece or two of their favourite games that were no longer played with and discarded when they were too big for it…a little pack of their favourite snacks and a photo or two of us together so that it really is a true memory box we can look through together and reminisce about the good times. Inside the memory box is 1 x A6 plain notebook, 1 x Square tin (9.5 x 9.5cm), 1 x brown envelope and 1 x screw cap jar. I have been writing down funny things the kids say and also collecting shells from the beach when we visit, there is a little snippit of hair from their first haircuts in the brown envelope and the whole box is big enough to contain many years of memories! Priced at just £19.99 I think this is a fabulous gift and personal keepsake that I know I would be so happy to receive. Its the thought that counts and with a gift like this it really does have thought and memories behind it. I was sent one of the boxes for the purpose of this review, all views and opinions are my own and genuine.